A lot of people migrate from bottling to kegging over time. The common reason cited by most of us is the extra hassle involved with the bottling process and cleaning/sanitizing bottles. But there are a few additional reasons I look back on bottling in the past tense. For example, when you have “1” keg of something, it sounds lonely and feels like it needs a companion. This logic then leads you to grow to having 2 or 3 different beers hanging around at one time. This sounds very practical when you say “3 beers”, but if you open up your beer fridge and have 100+ bottles of beer you look like you have a problem. Another one I learned was that although having to dump out a batch of lackluster beer is sad in any occasion, it’s much more sad to open 20+ bottles and pour them down the drain rather than pop the top on one keg. Even though kegging has its advantages, one notable downside is it makes it a lot more difficult to share your homebrew. 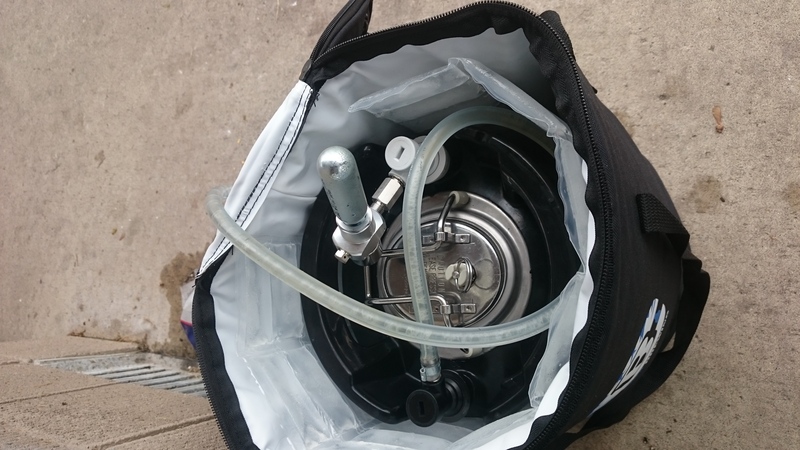 There’s some good gear out there like pressurized growlers, bottle fillers, and equipment to mobilize your keg. But if you’ve ever brought a keg with you to a party, you know CO2 is a challenge. 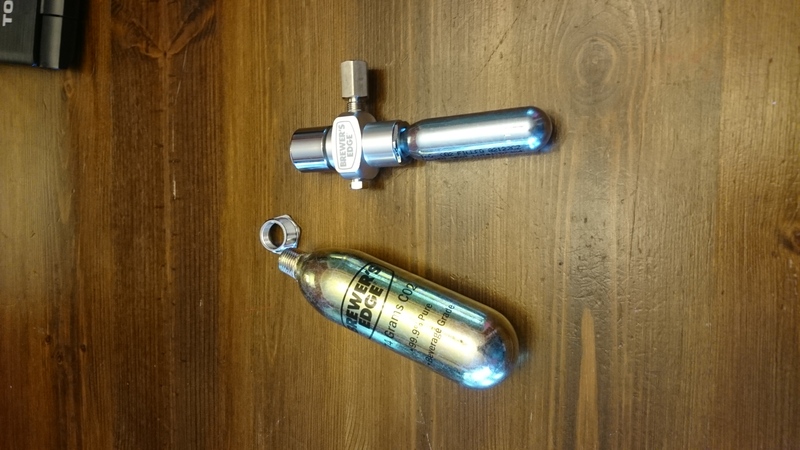 Disassembling your kegerator to lug a 5 # CO2 tank and its hoses around isn’t practical. So there are a number of options out there that make use of small 16 gram (and some up to 74 gram) CO2 cartridges. There are simple ones that just have a trigger and you shoot a small burst of CO2 into your keg from time to time. These are OK, but you find yourself babysitting the keg all night because they’re not intuitive to the rest of the party-goers and you typically have people telling you that you’re out of beer when it just needs a trigger shot. So the better bet are the ones with a built-in pressure regulator where you can set a serving pressure and leave it (until you really run out of CO2). Brewer’s Edge has a micro regulator that comes with an adjustable pressure knob, and a female fitting to allow you to screw in a standard gas quick-connect. It accommodates the typical 16 gram CO2 cartridge but also allows you to change out your adaptor and attach the big daddy 74 gram CO2 cartridge. It has a dial that allows you to set and leave a pressure from 0 – 30 psi, and let the regulator do its job of bleeding in more CO2 as needed as beer is drank out of the keg while you go worry about something else. The appearance of this micro regulator is quite striking when you pull it out of the box. A battle for your attention immediately ensues between the shininess of its polished aluminum body and the clean precision machined edges. It definitely gets top marks in appearance. The knob functions, well, like a knob. The best feature is the seal. While you might think a seal is as exciting as a knob, the seal is key to these little portable CO2 dispensers. The amount of CO2 held by the cartridges is small, so a small leak can lead to either a rack up of expenses as $2 empties pile up around you, or the biggest disappointment of the party when your keg no longer dispenses even though it still has beer in it. 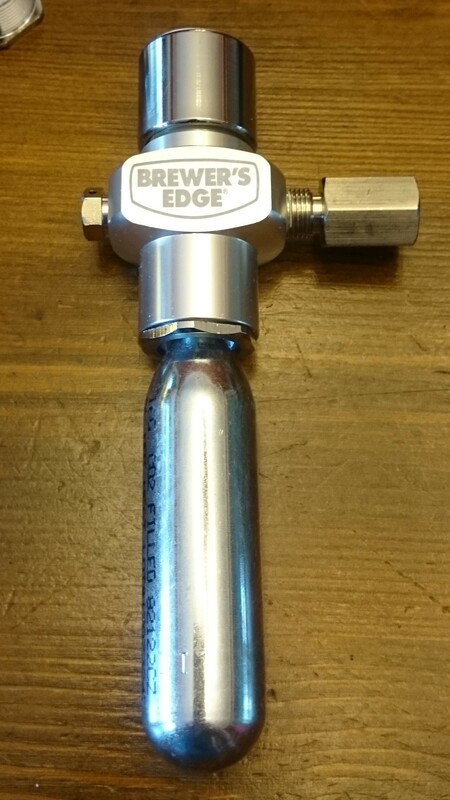 With this Brewer’s Edge regulator, a new 16 gram cartridge worked for me on a 2.5 gallon keg for 3 hours of a party and still had gas left over. And when I went back to it 2 weeks later, it hadn’t bled down to empty like others I have tried. 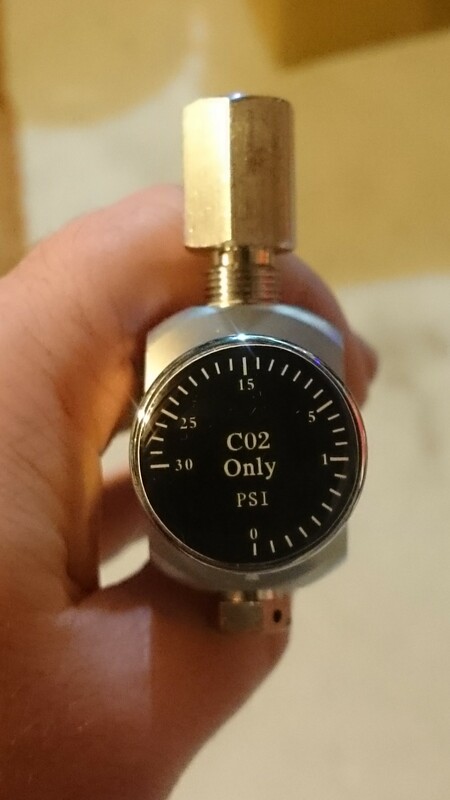 As an engineer, one design aspect of most of these portable CO2 dispensers that frustrates me is that while screwing the CO2 cartridge in, it runs into the piercing barb before it engages the seal. As a result, you get a huge rush of your precious CO2 blowing out and freezing your hand before you can screw it down fast enough to reach the seal. In addition to the finger frostbite, you run out of CO2 in that 3-hour party and find yourself getting frustrated with the design multiple times in one party, with each cartridge change. I was happy to find that the Brewer’s Edge Micro had a point where you felt the seal engage as you were screwing the cartridge in, and then after more turning, you felt the barb pierce the cartridge. If all portable CO2 dispensers worked this well, it wouldn’t be worth noting. But in my experience, they don’t. Overall, the regulator looks fantastic and works well. There are definitely cheaper options out there for portable CO2. But when you start to factor in the cost of multiple cartridges per party, over time the superior seal performance pays for itself. Special Thanks to Brewer’s Edge and William’s Brewing for providing the unit used for evaluation in this review. Portable Serving: As an on-the-go regulator. Backup – I’m out of CO2 and I want to pour a beer! Use as a backup if your main CO2 tank runs out. Swap out the CO2 line for this regulator and you’ve got a temporary solution to keep you up and going until you can get more CO2. Serve Beers at Alternate Carbonation Levels: This regulator goes up to 30 PSI. That’s plenty to serve high carbonation beers like Hefeweizens and Belgians. If you don’t have a dual or triple pressure setup, you could use this regulator to serve beers at higher pressures. I would not suggest force carbonation with this unit. The 74g cartridges would be pricey. You could carbonate using your existing regulator or just as easily naturally carbonate with priming sugar. After the beer is completely carbonated, use this to serve at the higher pressure. This entry was posted in CO2 Hardware, Draft, Featured Reviews, Great Deals, Portable Serving, Recent William's Brewing, Regulators, Reviews, Reviews & Top Posts, William's Brewing on November 1, 2017 by admin.